This is a low profile gauntlet for the Phoenix hand. You can download it here on thingiverse. This is a remix of the Team UnLimbited Gauntlet V4. My goal was to integrate the gripper box into the gauntlet itself so it can be very low profile on the wrist of the user. This release contains all the required files to create thermo-formed gauntlets for e-nable devices and is currently compatible with both Raptor Reloaded and Phoenix hands. 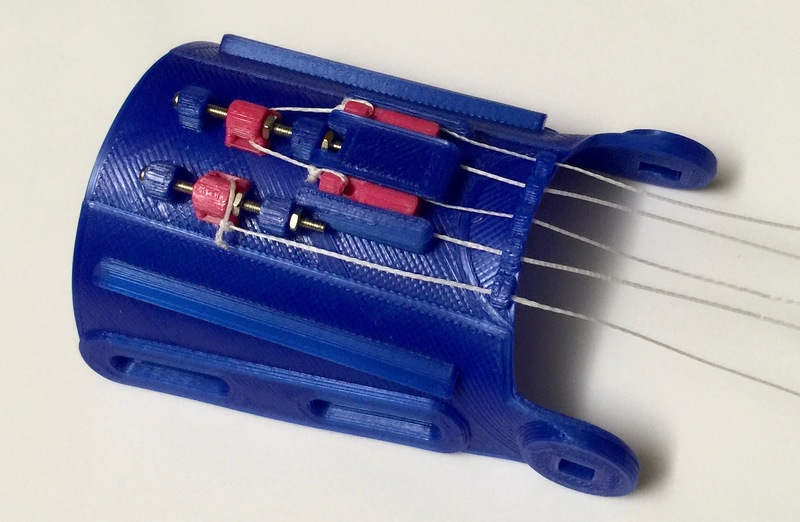 Printed in PLA the gauntlet is heated when printed to form a natural, strong gauntlet. I did not include the forming jig. I designed the bolts around M2, M3 and M4 bolts. These are pretty readily available with various head types and lengths. The fabrication guide will eventually have a table to match the scale of prints and the required size bolts. The bolts are meant to spin freely in the plastic. So those holes need to be drilled out after printing for most sizes. The end nut should be a locknut. It is the captured nut in the whippletree that moves. The cover is thermoformed seperatly and slides into the holding slots. For best results heat the cover and quickly form it over your already formed gauntlet by sliding the cover into the slots. Before the cover is set, remove it from the slots and bend it slightly more and let it harden. This way the cover is slightly tight and holds better to the slots. This entry was posted in Prosthetics. Bookmark the permalink.